There are numerous ways of identifying support and resistance, but many traders miss the values right in front of them. Humans think in ‘round’ figures and so do traders; price action can exhibit this phenomena. In this article, we outline the ‘Major,’ ‘Less-Major,’ and ‘Minor’ Psychological Support/Resistance Levels. Have you ever been in a trade that was working out really well, and as you watched comfortably with a long position as prices surge higher, you see price action beginning to stall? And it may stall for a little while; maybe a few minutes, or maybe a few hours but eventually it becomes clear: The trend you were in is trending no more. What happens after that is really up to the market. If the reason for that trend to initially take place still exists, well then it may continue trending. But if prices have moved so far, so fast that that information has been ‘priced in,’ then that trend may cease to exist. This is support and resistance; and after a currency pair goes on a prolonged trend, it eventually reaches a point where no new buyers want to buy, and sellers begin to look at the new, higher prices as an opportunity to realize some of their floating profits. This is where a top develops, and this is where price action denominates market dynamics. As computers became more popular, so did the methods that traders used to identify support and resistance. Fibonacci, fractals, and off-beat indicators like Parabolic SAR became popular as traders looked for new and more inventive ways to trade. If I were to ask you how much you paid for your car, or your house, or even that pair of shoes that you were wearing; odds are that you’d give me a rounded figure in response. And the reason is that, as a human being, we value simplicity. And the odds are that if I’m asking that question, I don’t care about the ‘264.26.’ Likely, I just wanted a ‘ballpark figure’ in response to get a general idea. ‘About 29,000’ or ‘around 30k’ would both be acceptable answers that would provide the information I was seeking in a more simplistic format. This becomes relevant because traders are human, and just like human beings do in other facets of life; traders attempt to simplify by rounding to the nearest, rounded whole number. When a currency pair like EURUSD approaches a level like 1.4000, or 1.3000, or even 1.2500 for the first time in a year, this has a tendency to garner attention. Let’s say that EURUSD has just eclipsed 1.3000 for the first time in a year, and you decided you wanted to buy once price hits 1.3104. But if EURUSD breaks back below 1.3000, you no longer want to be long; so you place your stop loss right at a value of 1.3000. After all, if EURUSD was trading at 1.2900 at the end of the US session on Monday, and opens the US session on Tuesday at 1.3104, this catches attention. It’s glaringly obvious. Will this spark a reversal? Unfortunately that’s unpredictable at-that-point, as there isn’t enough information to determine whether prices will reverse simply because a particular level was hit. But at the very least, it could cause trends to stall as the market attempts to digest these new prices. These are the major levels and they take place in 500-pip increments in the major currency pairs. 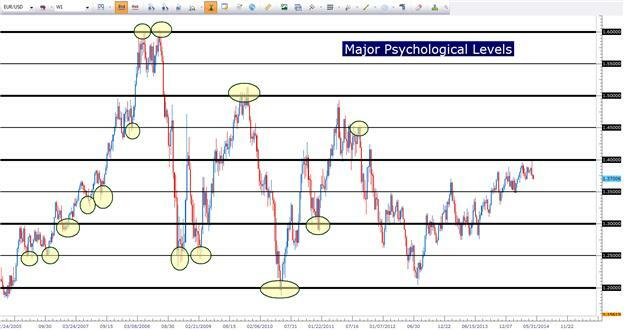 In the chart below, we’ve identified the most recent ‘major’ psychological levels that have been ‘in-play’ on the EURUSD weekly chart. The levels identified are 1.2000, 1.2500, 1.3000, 1.3500, 1.4000, 1.4500, 1.5000, 1.5500, and 1.6000. So the ‘Major’ levels will catch quite a bit of interest, and can potentially increase the probability of a trend stalling or reversing, but we can take this study a step further. 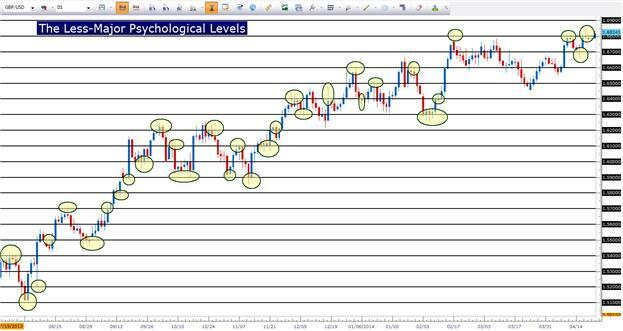 The 100-pip increments between these levels are also considered ‘Major’ psychological levels, albeit not quite ‘as major’ as the 500 pip increments we looked at before. These prices are less-round, but they still come up quite often as support or resistance in markets. 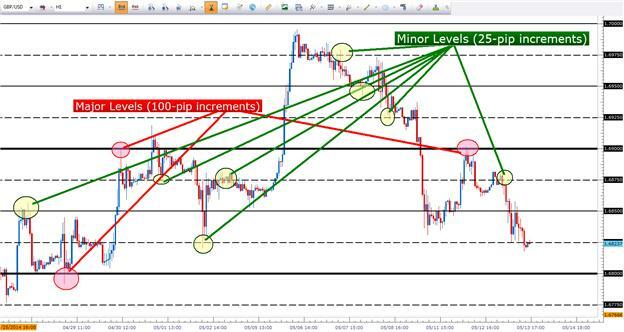 In the Daily chart below, we’ve identified these levels on GBPUSD using even, 100-pip increments. We’ve also highlighted numerous reversals or swings that took place with yellow circles. Notice how numerous reversals and swings take place when one of these levels gets hit. While not every trend reverses when a new major level comes into play, it can certainly give traders a valid mechanism for ‘buying low at support’ or ‘selling high at resistance’ when using this type of support or resistance mechanism. If traders could sit back and wait for reversals anytime a new major level comes into-play life (and trading) would be just too easy. Within each 100-pip interval are 3 additional levels that are considered to be ‘minor’ psychological support and resistance values. These levels are in 25-pip increments, and in the chart below we’ve moved into the hourly GBPUSD setup to look at the ‘minor psych’ levels in the pair. In the chart below, we’ve identified the levels of 1.6775, 1.6800, 1.6825, 1.6850, 1.6875, 1.6900, 1.6925, 1.6950, 1.6975, and 1.7000. Notice how we’re able to see more reversals now that we’ve integrated the ‘minor’ psychological levels. And while these levels may not be as consistent as the ‘Major’ or ‘Less Major’ psych-levels, they can still present considerable opportunity to the trader. In our next piece, we’ll show you 3 different ways to trade with these levels, including a mannerism in which scalpers or day-traders can integrate this into their approach. If you’d like to be notified when the next article is available, please click HERE to join my email distribution list, and I’ll be happy to email you the moment that it gets posted to DailyFX. Before employing any of the mentioned methods, traders should first test on a demo account. The demo account is free; features live prices, and can be a phenomenal testing ground for new strategies and methods. Click here to sign up for a free demo account through FXCM. Are you looking to take your trading to the next level? The DailyFX 360° Course offers a full curriculum, along with private, weekly webinars in which we walk traders through dynamic market conditions using the education taught in the course. Would you like to trade alongside seasoned professionals throughout the trading day? DailyFX On Demand gives you access to DailyFX Analysts during the most active periods of the trading day.